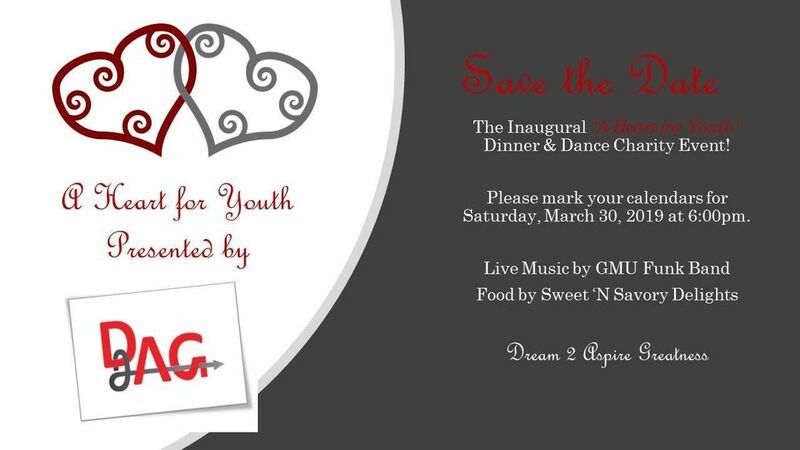 Dream 2 Aspire Greatness (D2AG) is hosting it's inaugural “A Heart for Youth” Dinner to benefit after-school programs and its summer enrichment program – Believe 2 Achieve. 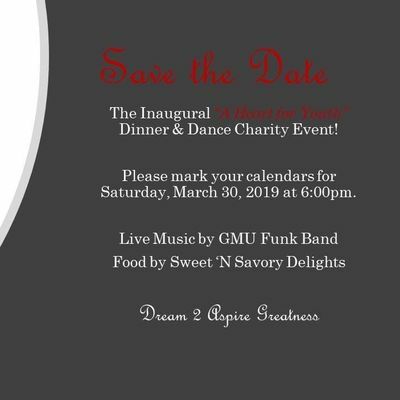 It is a fundraiser event that will include vendors, food by Sweet ‘N Savory Delights, and live music by the GMU Funk Band. As you may know, Dream 2 Aspire Greatness (D2AG) is a non-profit organization that provides workforce development and other resources serving youth and young adults (ages 14-25), as well as their families, in Stafford & surrounding counties (District 16); whose needs go far beyond simple assistance, companionship, confidence building, and minor academic or career guidance. D2AG provides basic needs services, as well as mentoring, tutoring, career exploration, job preparation, and financial literacy education. We believe children are the future and to ensure it remains bright, we instill lessons that teach resilience, compassion, harmony, and giving. We aim to guide our youth towards a positive path that ensures a secure, safe, and productive future. All ticket sales are final! Donation letters will be sent out. No, it is not necessary to bring printed tickets to the event. Names will be checked off at the door. Yes, in the event you are unable to attend; tickets may be transferred to another. Yes. You can update your registration at any time. Yes, names will be check off at the door!